This delightful apartment in Te Moenga Bay (Acacia Bay) is the ideal spot to relax on your holiday. With the lake only 50m away, it's an easy stroll to the bay for picnics and boating. The bay is safe for swimming. You can see the twinkling lights of Taupo township at night - only 5 minutes drive away; while Huka Falls is only 10 minutes drive. With stunning scenery, cafes and restaurants, and many tourist attractions it is easy to see why Taupo is such a popular destination. The apartment is our own family bach which we rent out when we are not using it ourselves. It accommodates up to 4 guests. The main living room has comfortable seating, a tv, freeview, and DVD player with DVDs, and opens onto the balcony with the BBQ. The sunny dining area is situated for a great view of the lake and seats four. A child friendly place with kids own table and chairs, toys, board games and kids tableware. Fully equipped kitchen including stove, oven, microwave and fridge/freezer. There are two bedrooms. The large master bedroom has lake views from the queen size bed and a sliding door onto its own balcony. The second sunny bedroom has two single beds. Separate bathroom with shower and laundry (washing machine and drier). The gated front entrance foyer has an outside table with seating for four. This apartment is one of four. There are two smaller apartments above this one. All are holiday homes owned by either family members or friends. Ideal if you are competing in one of the Taupo sports events. Includes a secure garage should you require safe storage for your bikes. You are welcome to use the two kayaks (ride on top). Adult size, some child size life jackets and a dog life jacket are available. Very occasionally the kayaks are stored at another property so please let us know if you know you want to use them and we will make sure they are available for you. Smoking allowed outside only. Pets allowed with prior approval. Extras: Linen (Optional : NZ$7.50 per single bed. $16 per queen). Beds are not left made up. Our family and friends have owned the four units for over 30 years. Our children have grown up holidaying with our extended family in this very special part of New Zealand. We hope you will enjoy your stay at our holiday home as much as we do. 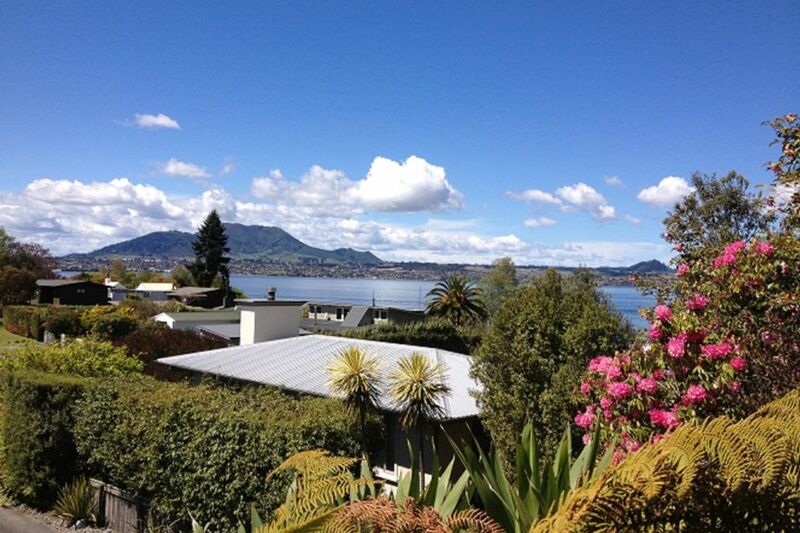 We simply love our holiday home with its views of the lake and Taupo township. Located so close to Te Moenga bay's grassed reserve with easy access into the lake for swimming or watersports. We have spent many days relaxing at the lake. At the end of the street is the Bay Brassiere for pizza, a drink or finer dining, as well as the dairy for ice creams! We can access the tennis courts, playgrounds, art café and bush walks without having to leave Acacia Bay. But Taupo is only a 5 minute drive away for everything else we need. Linen is available for a fee of $25. Parking in front of our garage. The boat park has a boat permanently there. You can park a motor boat in front of our garage or a larger trailer on the berm of the neighbouring section. The garage has our sports equipment and a small sail boat stored inside (including the two kayaks which are available for your use). There is room to store extra bicycles but will not fit a car. Towels are included in the linen charge. We don't have wifi available . There is free wifi available within Taupo township. Adult and child life jackets provided. Spacious light and airy place to stay very close to the water and easy reach of Taupo Town. An excellent, quiet location with beautiful views. Unfortunately though there were people in the unit above us and they had heavy feet so that woke us early in the mornings. Also, if you are using their lunen, you need to factor in the time it will take to wash, dry and fold the laundry before leaving. While it wasn’t ‘flash’ accommodation we would stay there again if we were guaranteed there weren’t going to be people above. Ideal location. Close to the lake and the main town. Slightly disappointed to find no internet at the property, this should be a standard amenity available. However this did not spoil our stay. Te Moenga bay has a lovely grassed area for picnics and easy flat access into the lake for swimming or watersports. With a boat ramp and jetty, and swings for the kids, it is a great place to spend your day . A short walk to the end of the street is one of Taupo's best restaurants - The Bay Brassiere for pizza, drinks or finer dining. As well as a well-stocked convenience store - with great ice creams! Further along the road is a 'fish-n-chips and Indian takeaway and a liquor store. Acacia Bay itself offers tennis courts, newly designed playgrounds, a wonderful art café and gorgeous bush walks. And of course all the activities the lake has to offer - swimming, kayaking, paddle-boarding, boating and fishing.